I love it when I have a new idea for some over-the-top treat. It gets me so excited and I can't wait to get into the kitchen and try it out. You know you've had your moments like this too and you feel like Edison probably did when he thought up the light bulb. Of course, it's not like a treat is as important as the light bulb, but it's still a good thing, nonetheless. Anyway, back to the idea. 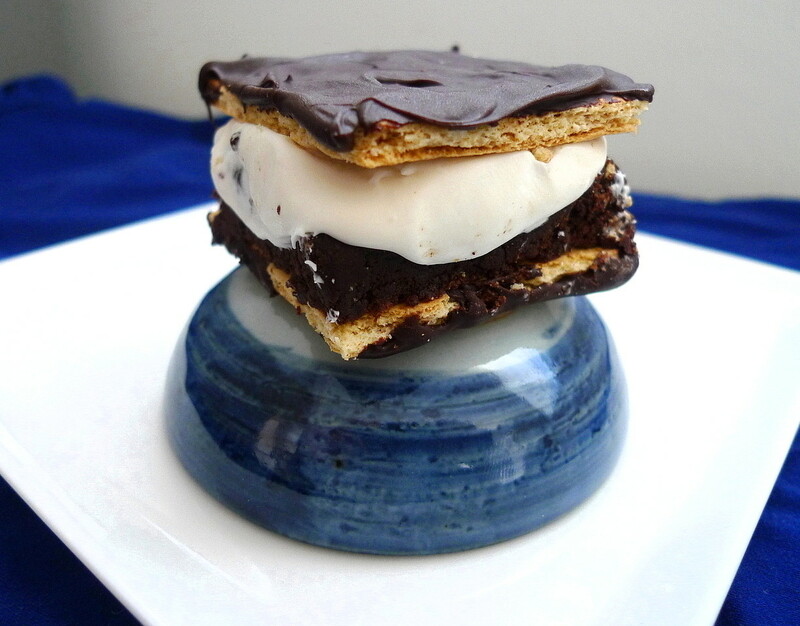 I was thinking about s'mores and how to go about creating what would be, to me, the ultimate s'mores ever. This would be rich, it would be decadent, it would be overly indulgent and require at least an hour or two at the gym to work it off, but oh it would be worth it. 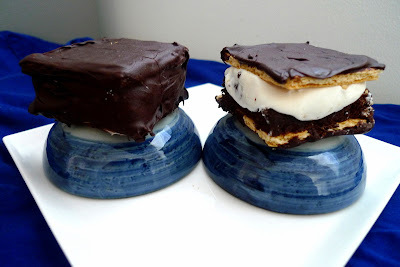 I started off with chocolate dipped graham crackers. Then, I'd top them with a layer of brownie. But, not just any brownie. True, you could use a boxed mix, but like I said, this had to be the ultimate. So, I used the absolute best brownie recipe ever - Alton Brown's Cocoa Brownies. I've posted about these before HERE and mentioned how they are so fudgy and dark that they'll blow your mind. Well, this was the time to use them. As you can see, I cut the pan of brownies into two layers, cut them to fit the graham crackers, and put one uber-fudgy layer onto each one. I know, you're wondering, why go to all the trouble of having to cut it into layers? Why not just bake them in a bigger pan? Well, this particular brownie recipe bakes up thicker than other recipes and the gooey-est part is on the inside, underneath the crackly top. I figured that if I baked them thinner, I just wouldn't get that same moist fudginess. At least that was my reasoning and it seemed to hold true. I then whipped up a marshmallow frosting. I used a dab of the marshmallow frosting under each brownie to hold it in place. Then, I dolloped the frosting onto the brownies and spread it into a nice thick layer. 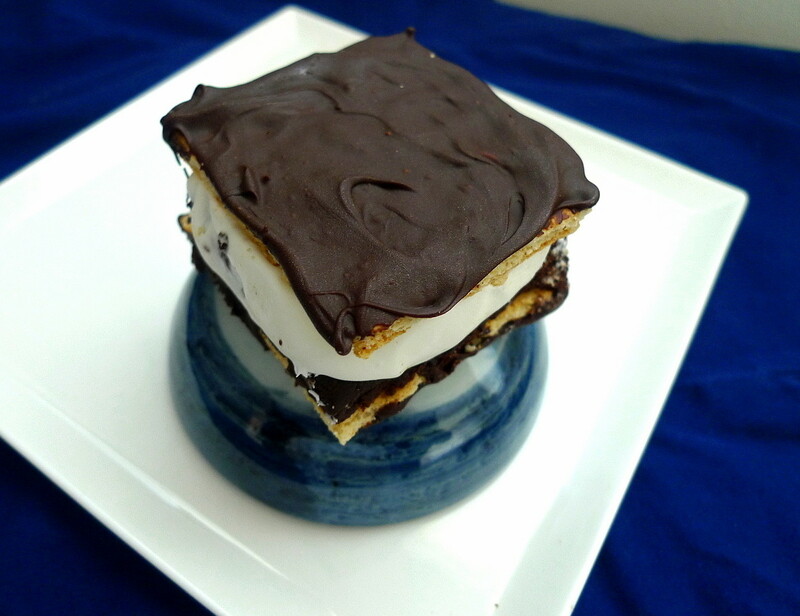 Finally, I topped it with another chocolate covered graham cracker. I also tried to cover the entire thing in chocolate but soon realized that it was going to take way too much time and way too much chocolate (in hindsight, I should have just made some ganache and poured it on, but, I can do that next time). So, I went the easy route and just spread the chocolate on the graham crackers and left it at that. Finally, I chilled the sandwiches. This makes the brownies even more like fudge and solidifies the frosting a little so that it truly becomes like marshmallows. The best part, of course, was eating them. 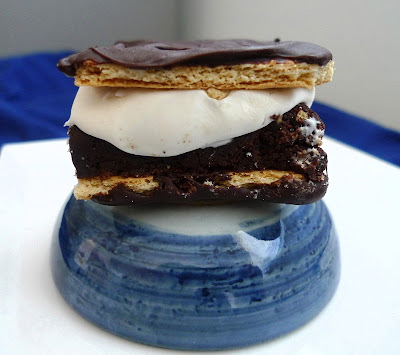 All that chocolate on the outside shatters when you bite into it, then you crunch into the graham cracker and your teeth sink into that soft, fluffy, marshmallow frosting and sinfully rich brownie. It's a s'mores experience like no other. Mmmmmm. All the best s'mores flavors and you don't even need a fire. Preheat oven to 300F. Line an 8x8 pan with foil, leaving some to hang over the sides. Melt the butter. Add the sugars and mix well to combine. Mix in the cocoa powder. Whisk the eggs in a separate bowl until well combined and add to the butter-sugar-cocoa mixture along with the vanilla. Stir in the flour and salt until just combined. Pour the batter into the pan and bake for 45 min. (mine took 1 hour). Check for doneness with the tried and true toothpick method: a toothpick inserted into the center of the pan should come out clean (I took mine out of the oven while they were still slightly gooey in the center). When done, remove to a rack to cool for 45-60 min. Beat the butter with the marshmallow fluff until well combined. Beat in the powdered sugar until light and fluffy. Stir in the vanilla. Carefully slice each graham cracker sheet in half so that you end up with 36 separate crackers. Melt the chocolate chips and stir in the oil until smooth. Dip one side of each graham cracker into the melted chocolate, lay out on a parchment paper lined cookie sheet, and chill in the fridge for 15 min. until chocolate is hardened. When the brownies are cool, lift them out using the foil. Put the graham crackers on top and cut the brownies to fit the graham crackers (you should be able to get 9 squares total). You'll have some of the edge scraps left over (you can just eat those). 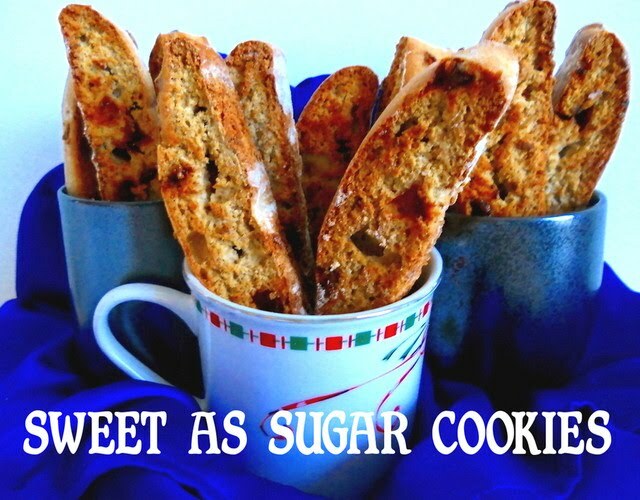 Lay the graham cracker, chocolate side down on a piece of parchment paper or a cookie rack. Smear a little marshmallow frosting onto each cracker. 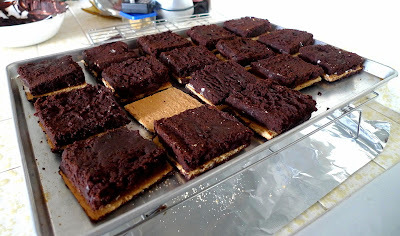 Cut each brownie in half, horizontally so that you have two layers (the top and the bottom). Put each layer of brownie one of the frosting covered graham crackers. Spread each brownie evenly with 1 Tbsp. of marshmallow frosting. Top with another chocolate covered graham cracker. If desired, you can go ahead and cover the entire sandwich with chocolate. Chill in the fridge until ready to eat. Note: If you decide to cover the entire sandwich with chocolate, you'll probably need to double the amount of chocolate chips and oil in the recipe. I've heard so much about baked goods made with sweet potatoes - like pie and cupcakes. However, I've never tried them before, though I have eaten baked goods made from purple Okinawan sweet potatoes or Korean sweet potatoes. People always say that it tastes a lot like stuff made with pumpkin. 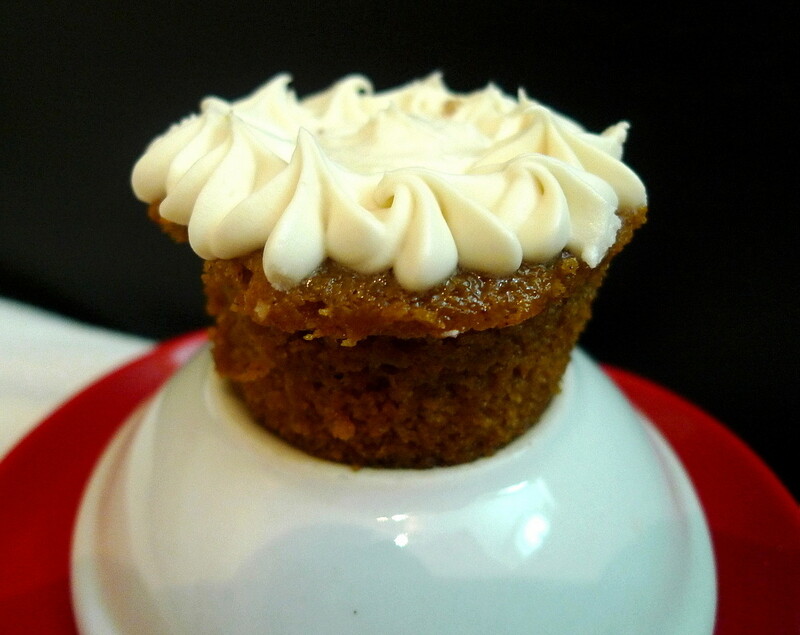 Well, you know how much I love pumpkin, so I was sure I was going to love these cupcakes. Plus, sweet potatoes were on sale, so it was definitely time to make them. I' m not sure how well pureed other people get their sweet potatoes, but mine still had a lot of little chunks and bits in the mixture. I wasn't sure how that would affect things, but decided to just go with it. Knowing how I like things spicy, I also decided to double the amount of cinnamon in the recipe and added some ground ginger as well. The cupcakes, first of all, smell amazing. It's a sweet, spicy scent that's like pumpkin and yet not like pumpkin. It just smells rich and golden. As for those tiny remaining chunks of sweet potato, they melt right into the cake and you won't even know they're there anymore, except that you have a cake that is supremely moist and full of sweet potato flavor that will knock your socks off. I never knew that sweet potato cake could be so good. I'm a believer now. As for the marshmallow frosting, it goes hand in hand with these cupcakes - think candied yams with lots and lots of marshmallows on top (oh yeah). Sweet potato - you rule! Preheat oven to 350F. Line a cupcake pan with liners. In a large bowl, whisk egg and sugar together until combined and no lumps remain. Add in vanilla extract and butter, then whisk in sweet potato. Add in flour, baking soda, salt, cinnamon and nutmeg, then add in milk and stir until combined and smooth. Fill each cupcake liner about 3/4 full. Bake for 20-25 minutes, or until cupcakes are set and spring back at the touch. Let cool completely before frosting. Beat butter in the bowl of electric mixer until creamy. Add in fluff and beat for 2-3 minutes, then add in vanilla extract. With the mixer on low speed, add in powdered sugar 1 cup at a time until fully incorporated. Once all the sugar has been added, beat on medium-high speed for 2-3 minutes. If mixture if too runny, add a bit more sugar. If it’s too thick, add a bit of milk one teaspoon at a time. Frost cupcakes as desired. Peanut butter and jelly brings back so many memories of my childhood. There's all those times that I took a peanut butter and jelly sandwich in my Hello Kitty lunchbox to school. Then there's that song we used to sing in elementary school, you know, the one that goes: Peanut . . . peanut butter. And jelly! And jelly! I even remember one time in fourth grade where we were supposed to write down the directions for making a peanut butter and jelly sandwich and then the teacher would follow our directions exactly and try to succeed in making the sandwich. Naturally, when you're only nine years old, you forget to write down things like, "Open the jar of peanut butter," or "Use a knife to spread the jelly." Needless to say, it was an extremely funny exercise. And now, even as an adult, the peanut butter and jelly combo just never gets old. It's just so good! Which is why I had to make a peanut butter and jelly cupcake, for old times sake and for the kid in you that never gets old. I used the peanut butter cake recipe from Brown Eyed Baker and changed it slightly by using some brown sugar in place of the white and adding more milk. I think the extra milk made for much tenderer cupcake and I was very pleased with how the crumb came out. 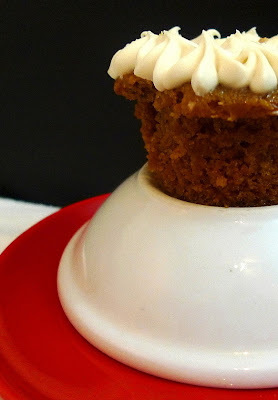 These cupcakes were super peanut buttery in every bite, soft, and stayed moist for days (even in the fridge). 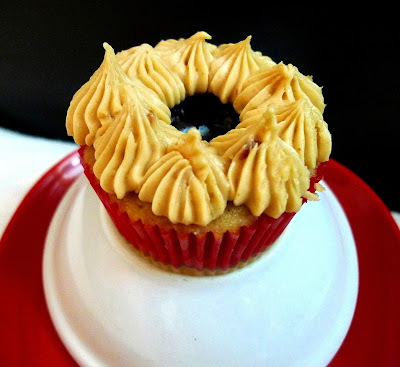 Paired up with a grape jelly filling and topped with peanut butter cream cheese frosting, they were peanut buttery perfection. So go ahead, make these cupcakes, grab a glass of milk, and enjoy a sweet version of peanut butter and jelly that will make you smile. Preheat oven to 350F. Line standard muffin pans with paper liners. Whisk together the flour, bkaing soda, and baking powder. Cream the butter with the peanut butter. Add the sugars and cream together till pale and fluffy. Beat the eggs and add in two batches, beating for 1 min. after each addition. Mix in the vanilla. Add half the flour mixture, then the yogurt, then the rest of the flour mixture. Beat until just combined. Mix in the milk until just combined. Divide the batter into the lined cups. Bake for 20-25 min. until a toothpick inserted into the centers comes out clean. Transfer the cupcakes to wire racks to cool completely. Beat the butter with the cream cheese until mixed together. Mix in the peanut butter, then beat in the powdered sugar until light and fluffy. Cut a small cone out of the center of each cupcake. Fill with 1 tsp. grape jelly. Pipe with the peanut butter cream cheese frosting as desired. Eat the little cake cones to your heart's desire. The original recipe called for 1 1/3 c. granulated sugar. I used half white sugar and half light brown sugar instead. Instead of sour cream, I used nonfat Greek yogurt. The batter, once mixed, looked a little thick, so I added 1/2 c. milk to thin it down a little. I used grape jelly instead of strawberry jam (just my preference). 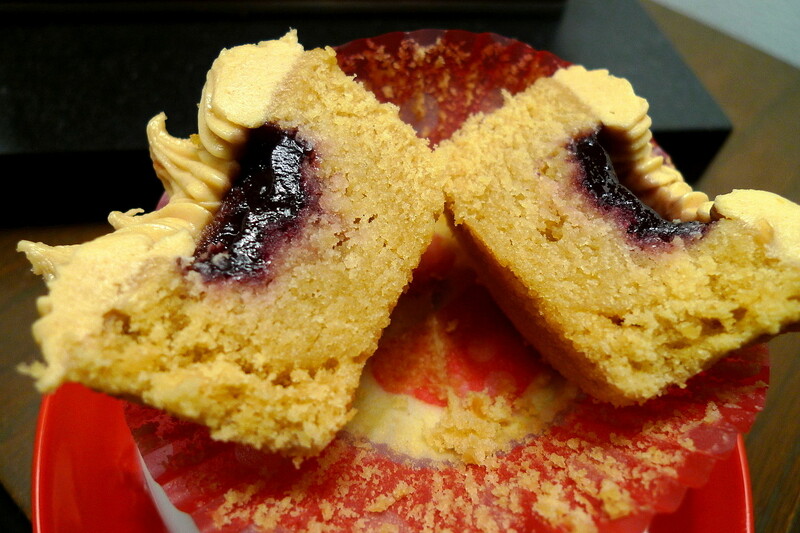 I chose to fill the cupcakes with the jelly instead of just dolloping it on top. For this month's Secret Recipe Club, I had such a hard time choosing what to make from Evelyne's blog, Cheap Ethnic Eatz, that I did not make a decision until yesterday morning. At first, I was all set on making her chocolate covered peanut butter cheesecake (believe it or not, she made hers in the shape of a fish). I even had all the ingredients for it. But, then, at the last minute, I steered in a completely different direction and decided to make her Blueberry Upside Down Cake. Of course, now, it means I've still got peanut butter cheesecake on the brain, but oh well. 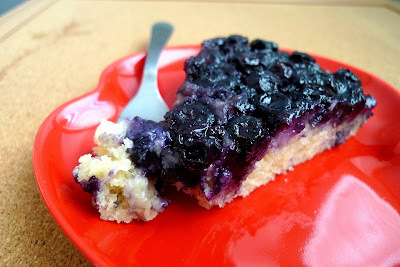 I've made pineapple upside down cake in the past but had never tried it with blueberries. It was such a nice change. The blueberries get totally jammy and the lovely golden cake beneath it is the ideal pairing. It's sweet, but not too sweet, and with all that anti-oxidant filled fruit I say it's healthy, which means that cake for breakfast in this instance is perfectly okay. Plus, the cake is so versatile that you could add cinnamon, lemon, or oranges to it, something that I intend to do the next time I make it. All in all, this cake made my Sunday morning a real treat. Thanks Evelyne for your delicious cake! In 9 inch square cake pan, combine melted butter and brown sugar; spread evenly on bottom. Spread blueberries evenly over top. Sprinkle with lemon juice. Cream butter; gradually add sugar, beating until light. Beat in egg and vanilla. Sift or mix together flour, baking powder, salt and cinnamon if using. Add dry ingredients alternately with milk to creamed mixture. 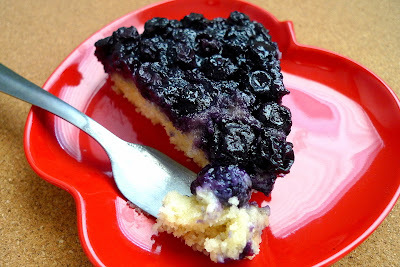 Spread batter evenly over blueberry layer. Bake in 350°F oven for 45 to 50 minutes or until toothpick inserted in center comes out clean. Let cool 10 minutes in pan, then turn out on to large flat plate.